Did you know that 1 out of every 3 people in the UK has mild to severe types of gum disease? The number rises to every 2 out of 3 once you get to seniors. The sad part is that most of these diseases could have been prevented by taking good care of your mouth. But therein lies the problem. I mean, it’s always hard for parents to get their kids to brush their teeth regularly. So you can imagine the uphill battle trying to convince everyone else to floss. C’mon, as beneficial as it may be, traditional flossing also has its shortcomings. The string wraps around your fingers tightly which is always painful. Besides, I’m sure you have better things to do than carefully manoeuvring a thin, slippery piece of string between your teeth so it doesn’t attack your gums and draw blood. Water flossers offer a safer and more effective alternative to string floss. Not only do they dislodge food debris and flush away bacteria and plaque, they are also far gentler on your gums than both string floss and toothbrushes. We’ve spent hundreds of hours under the sink testing out different oral irrigators on all kinds of mouths to get you the crème of the crop. Here’s a bit of what we found out about the top best models and how to choose the best water flosser for you. Waterpik understands that your mouth is the gateway to your health. As such, it’s important to keep your teeth and gums as healthy as possible. 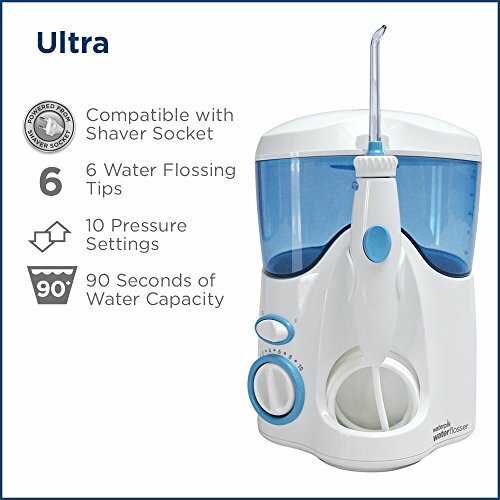 This is where their latest and most advanced Waterpik WP-660UK Ultra Professional Water Flosser comes in. Featuring a contemporary and compact design, this bad boy is packed with so many different functions you wouldn’t believe it. For starters, there’s a 1-minute timer and a 30 second pacer so you can take the guesswork out of flossing. This means that all it takes is a minute to achieve a clean, fresh and healthy mouth. But trust me when I say, that’s a minute well spent. The WP-660UK Ultra Professional Flosser incorporates a unique combination of fingertip easy control water pressure and irrigation pulsations. This allows the WP to clean deep between your teeth and below the gumline while removing plaque and harmful bacteria that traditional brushing and string floss can’t reach. The user friendliness is also worth mentioning. All you have to do is pop open and fill up the reservoir with water, point the tip at your gum line and feel the magic happening. Read our full review of Waterpik WP-660. Incredibly effective plaque and bacteria removal. Ideal for use on implants and around braces. If there’s one thing you can rely on from the brainiacs over at Phillips, it’s their ability to incorporate an incredible amount of technology in the most compact devices on the planet. If you thought that our previous model was tiny, wait till you get a load of what the geniuses over at the Phillips lab did. The Philips Sonicare AirFloss Power Flosser makes use of both water and air pressure to effectively blast away bits of trapped foodstuffs, plaque and bacteria in hard to reach places. Thanks to the microburst technology, all you need is a small amount of water to achieve a thorough clean; no more unnecessary messes. But what really grabbed my eye is how easy to use the Sonicare AirFloss Power Flosser is. There’s even a guidance tip that lets you seamlessly glide along the gum line until it settles between your teeth. Phillips also incorporated an angled nozzle head for easier manoeuvrability and longer battery life. As a bonus, the Sonicare Flosser has been proven clinically safe and gentle on your gums, teeth, implants, braces and other dental restorative materials. 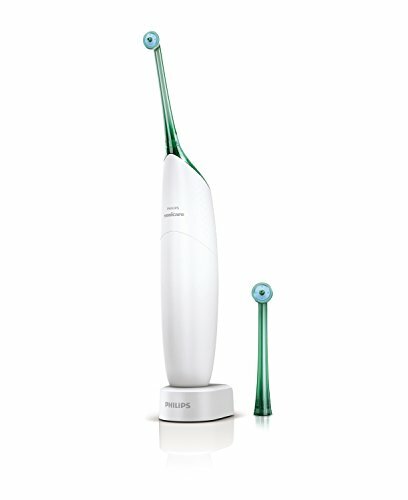 Read our full review of Philips Sonicare Flosser. Effective cleaning with over 99% more plaque removal. Makes use of both water and air for more intense cleaning. Longer battery life with 2 pin UK bathroom plug. If you really enjoy a hearty feast but don’t like poking at your gums with a toothpick once you’re done, then this bad boy was made just for you. The Portable oral irrigator is an advanced dental water flosser from Elecjoy that has really been living up to its name. Boasting of a powerful pulsating jet-water flush, this device clears out over 90 percent of your gums which improves your oral hygiene and prevents gum disease. As mentioned earlier, the Oral Irrigator specialises in dislodging and removing any left over food by passing water in areas that toothbrushes and traditional string floss wouldn’t reach. But that’s barely the best part. This water flosser incorporates quite the sizeable water tank reservoir. At 165ml and 2 additional replacement nozzles, the Elecjoy Oral Irrigator is ideal for multiple users. And if you’re worried about your braces or other dental implants, there’s no need to fret. This water flosser is as gentle as they come. Read our full review of Oral Irrigator Water Flosser. One of the most affordable oral irrigators. Comes with replacement nozzles for more than one user. Different operating modes for customized flossing. Here’s another winner from one of my favourite dental hygiene companies in the UK. Waterpik has definitely carved out a niche for itself, and each of its products are getting better by the day. 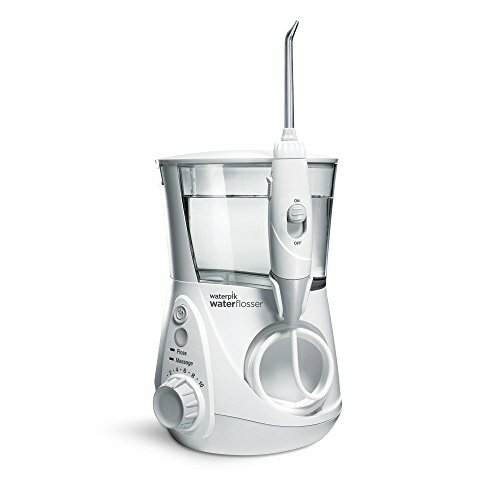 The Waterpik WP120UK Ultra Water Flosser is incredibly similar to the WP660 that we looked at earlier. For one, it makes use of the same unique combination of water pressure and irrigation pulsations to clean deep between your teeth and below the gumline while removing plaque and harmful bacteria that traditional brushing and string floss can’t reach. However, there are certain differences that make the WP120UK Ultra Flosser its own man. For starters, it comes with quite the impressive array of tools and accessories. This includes a classic jet tip, a plaque seeker tip, a toothbrush tip, a pik pocket tip, an orthodontic tip, and a tongue cleaner. This allows for some of the most advanced, precise and personalized mouth cleaning I ever saw in a single device. But that’s not the best part! All these tools and accessories come with their own convenient on-board, covered tip storage. Read our full review of Waterpik WP120. Highly effective, 3-second plaque removal. 50% more healthy and efficient than string floss. Delivers 10 to 90 PSI at 1200 pulses a minute. Includes a plethora of onboard tools and accessories. While a water flosser is basically a pressurized jet wash for your mouth, there’s a lot more that goes into getting the perfect oral irrigator than that. For instance, how much are you planning to spend? And you do know that you can’t take a countertop water flosser on a trip, right? Oral irrigators come in all sort of shapes, sizes, and designs. Lucky for you, we’ve compiled the key considerations and features to watch out for when buying a water flosser. Basically, there are two main designs under which all water flossers fall under. These include cordless oral irrigators and countertop water flossers. As the name suggests, countertop irrigators are mains powered units that incorporate incredibly large water reservoirs with more than enough capacity for multiple uses. While there are plenty of different models, the typical design includes a flexible tube with a handle that connects to the water tank. Countertop irrigators have the advantage of being incredibly powerful and reliable with a plethora of settings to support more accurate cleaning. But due to the large size, you can’t really call it a travel companion. This type is suitable for a more permanent family setting. In addition to being the most popular type, cordless water flossers offer the highest levels of portability. These models are super compact and contain a rechargeable battery that allows you to floss even without a power outlet nearby. Cordless models incorporate a slightly smaller water reservoir that is usually built into the handle and is good for a couple of uses depending on the brand. Although some models rival countertops when it comes to power, most models tend to have fewer settings and a tad unreliable at times. However, their cordless nature makes them ideal for people who travel regularly. In addition to just irrigating, water flossers clean out plaque, food debris, gingivitis and other issues by blasting a jet of water between the teeth and gums. Now, the higher the pressure, the more effective the cleaning action. But be careful because extremely high pressure might cause damage to orthodontic appliances and cause your gums to bleed. That said, finding an oral irrigator with multiple pressure settings and controls is ideal for a more personalized experience. With today’s tech packed water flossers, you’d be surprised at what some of these devices can do. While you’re out shopping for an oral irrigator, you’ll want to find one that supports a broad range of tools and accessories for a well-rounded and more thorough clean. This includes accessories like classic jet tips, plaque seeker tips, toothbrush tips, pik pocket tips, orthodontic tips, tongue cleaners, just to name a few. This allows for some of the most advanced, precise and personalised mouth cleaning using just one single device. It also helps if all these accessories have their own on board storage for even more convenience. This is perhaps the most important aspect to consider. It doesn’t matter how effective a water flosser is if you’re not comfortable using it. If you’re not at ease with minor aspects like the weight, handle size, water capacity, pressure settings and even the nozzle, make sure you point them out. This will help you get the best water flosser for your hands, home, and most importantly, your mouth. Q: How do you use a water flosser? It might surprise you to know that most people end up hating flossing because it’s complicated, unbelievably awkward or messy. Well, chances are that you might be doing it wrong, even with a simple to use water flosser. Here are a few easy steps on how to use a water flosser the right way. Fill the water reservoir with warm water and replace it or close it using whatever mechanism is located on your oral irrigator. If this is the first use, set the pressure dial to high, point it to the sink, and turn it all the way on until the water flows. Turn the pressure all the way down and lean over the sink. Place the water flosser in your mouth and close your lips to prevent splashing. But be sure to leave a small opening for water to flow out of your mouth to the sink. Start at the back teeth and work your way to the front aiming just 90 degrees above the gumline. Turn unit off when finished and remove the tip (if any) with the eject button for proper drying. Q: Can I use a water flosser with braces? Absolutely! Water flossers are actually safer and gentler to use on braces than toothbrushes and string floss. Not only does the pressurized water clear out plaque and bacteria all around the braces, but it’s been also proven clinically effective for flushing out bacteria and debris at the point of contact between your teeth and the braces. Q: How often should I use my water flosser? According to the Dental Association and World Health Organization, we are advised to use oral irrigation at least once a day and brush our teeth at least twice daily. Why? Because it is essential to maintaining peak oral hygiene and overall dental health. So, to recap – water flossing is not only the most effective way of removing layers of plaque and harmful bacteria stuck along your gums and teeth, it’s also the safest and gentlest way of achieving well-rounded, thorough oral hygiene. Water flossing is also simpler, quicker, less messy and most importantly, way more fun than playing around with string. What’s more, they can be used whether or not you have implants, bridges, crowns, sensitive gums or any orthodontic appliances. So do yourself and your family a big favour and get the best water flossers on the market. Trust me, your fresher, cleaner and healthier mouth will thank you for it. And don’t forget to tell us all about your experience with our above top ranking models.